• Increased air pressure thanks to a highly efficient blade design of the three 120mm Pure Wings 2 PWM fans, making these fans the perfect partners to work with the radiator. • Three Pure Wings 2 120mm PWM fans feature airflow-optimized fan blades and variable speed operation. be quiet! 360mm Silent Loop Ultra Quiet All-in-One Hydro Cooler, 3x 120mm Pure Wings II PWM Fans, Copper Rad, 2066/AM4 is rated 2.7 out of 5 by 3. Rated 2 out of 5 by ComputerUser from You can get better than this The fans look very plastic and cheap. I am not sure if they are any good as I swapped them for Noctua fans. However, this radiator is not good. The fin count is far too low. Had it been higher, this would have been a very good cooler. While this is a 360 rad, it probably has the same surface area as a 240 rad due to the spacing between the fins. The pump itself is also too noisy. 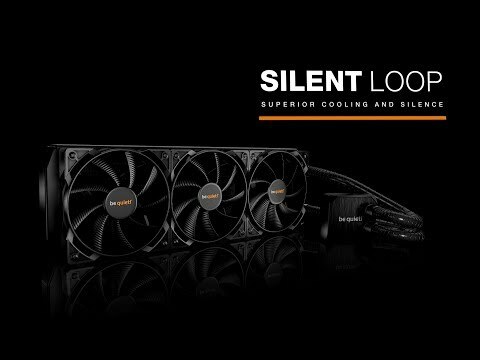 Rated 5 out of 5 by Paul from Immense cooling levels Lets be honest, this cooler is not cheap, however it is extremely quiet even with all 3 fans running at 1500RPM and it's cooling is huge. I am running this cooler on a Ryzen 5 1600 overclocked to 3.85 Ghz and at a continous 100% load it's sitting at 48-49 Celcius, my previous cooler was a Corsair H60 and that gave figures of 60 Celcius so I am very happy with the Be Quiet. Rated 1 out of 5 by madman83 from Wast of money Two screws were de-threaded by the radiator screw holes and was unable to remove the radiator from my case with ease. I eventually removed the screws (which was completely bold) damaging my new £115 case and damaging the screw hole in the radiator. Also the back mounting bracket is made of plastic. when tightening the mounting nut with not too much force one of the mounting hole on the plastic bracket snapped. When trying to remove back mounting bracket, the bracket was stuck in one of the mounting holes in the motherboard and when i tried removing the back mounting bracket it broke almost damaging my motherboard.